Quick getaway to the turquoise Punta Cana | It's a Wonderful World! Punta Cana in the Dominican Republic has the same signature that makes all the Caribbean destinations tourist hot spots – constant 80F temperatures all year round, beach-front resorts in the plentiful and within easy reach of the U.S.
Escaping the frigid temperatures of New York in March, in Punta Cana we found exactly what we were looking for – stretch of soft powdery white sand opening into the warm and very turquoise sea, further made picture-postcard perfect by the palm trees. Catching a beautiful sunrise together with a rainbow, on one of our three mornings there was quite special too! 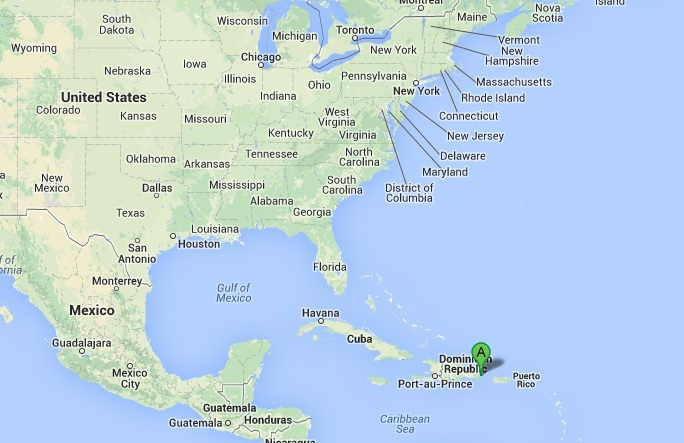 Punta Cana on the map. There are 2 big reasons to visit the Spanish speaking resort town of Punta Cana on the east coast of Dominican Republic – the white sand beaches and the color of the sea. Depending on the time of the day and the position of the sun, the sea changes from a sheet of color-less glass to a beautiful turquoise to a deep blue to a sublime bottle-green! The many shades of blue. The ocean from a distance. The sunny day acquiesces to dusk. A pensive moment on the beach. A solitary evening stroll on the now deserted beach. The hint of a rainbow.